Advocate of God and consoler of Mary, this is the story of the "first" thief, whose wonderful eleventh hour conversion and defense of the holy Kingship of Christ on Calvary, merited him the everlasting title, "The Good." Monsignor Gaumé opens his book with a graphic, even ugly, description of the true face of a highway brigand in the days of the Caesars. He presents the first meeting of our Egyptian thief and the Son of God in the idolatrous land of the Pharaohs on the occasion of the flight of the impoverished Holy Family away from the sword of Herod. The rest of this profoundly inspiring account begins on the "Mount of the Skull." It is the story of the Passion as seen through this most unlikely of characters. Meet Dismas; a dying man whose only request from his "Lord" was but a "remembrance" in His Kingdom! Rejoice for a man who was the first to be with Christ "in Paradise." Charity is the crowning of the spiritual edifice. Without charity, faith would be void, and hope vain. 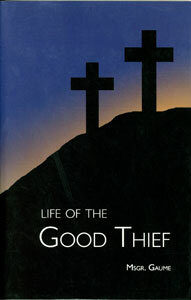 We have seen how great was the faith of the Good Thief; how perfect, his hope. Let us now con­sider the measure of his love. Love tends always to union with its object; so that to love is to unite. When the thoughts of our friend are our thoughts; when his tastes and interests are our interests and tastes; his joys and sorrows, ours; his losses, our losses; and his life forms, as it were, one with our life; then, indeed, is our love, true love. Now charity — the highest form of love — has, so to speak, two hands; with the one it holds fast to God, with the other, it clings to its neighbor. With the first, it raises itself up to its Heavenly Father; with the second, it draws after it its brethren and helps to bring them also to God, our One true End, and lasting reward. Thus, charity fulfils the prayer of Christ, and makes us all one, even as He and His Father are one. When charity has fully penetrated a soul, and has shown itself by works that require a great and ex­ceptional degree of courage, a courage stronger than death, then do we term such charity heroic. We do not hesitate to describe as such the charity of Dismas. In the order of Nature, we do not see the sun suddenly leap out of the night and change the dark­ness into perfect day; neither does the traveler, with one bound, reach the tops of the mountain; but slowly, and gradually, all things are done. The greatest end has, usually, but a small beginning. And, it is the same, in the order of grace. Hence the maxim: Nemo repente fit summus. Perfection is not reached with lightning speed. It is the fruit of much labor — of weary vigils, and fastings, and sufferings, and pain. But, sometimes, though rarely, God sees fit to dis­pense with the laws He has made, and thus we occasionally see certain happy souls attain, in a short time, to the greatest height of perfection. In the first rank of these privileged beings, stands the Good Thief. In a moment, in the twinkling of an eye, the seed of grace developed, in him, into the goodly tree of virtue. Nothing was wanting, neither the roots of faith, the stem of hope, nor the flowers and fruits of charity. His whole soul was on fire with the love of God, and so his past sins were burnt away and utterly destroyed. “This man hath done no evil. What crimes do you accuse Him of, ye, who have condemned Him — thou, Pilate, who didst expressly declare His innocence, and ye, Annas, Caiaphas, priests and ancients of the people? Was it a crime to preach to you the kingdom of God, and His love to men? Was it a crime to heal your sick, to raise your dead? Was it a crime to convert sinners, to comfort the afflicted, to feed the poor, to deliver those possessed? For which of these things is it, that ye have outraged and insulted Him, spat upon Him, covered Him with wounds, and nailed Him to the shameful cross? I and my companion, indeed, are guilty, and we are rightfully condemned; but He, Jesus of Nazareth, hath done no evil.” All this, and much more, was contained in those few words of the Good Thief: “This man hath done no evil.” Who can fail to admire such generous courage? “Let us examine carefully,” says a pious hermit, “what manner of man was this robber — lest, being ignorant of the cause of his hope, we should fall into the sin of presumption. All the friends, and neighbors, and kinsmen, and even the disciples of our Lord had left Him and fled. As it had been foretold: “I will strike the shepherd, and the sheep shall be dispersed.” Even the disciple, whom Jesus loved, had not remained with Him all the time of His passion. The Apostles seemed one and all to have forgotten the many signs and wonders they had witnessed, and the power of doing things yet even greater, which their Master had given them. But while the Apostles de­serted Him Whom they had previously confessed, the robber, who had not known Him during life, confessed Him, now that He was at the point of death.”6 His faith and courage being such, we need not wonder at the greatness of his hope, nor at its reward. As we have said, charity has two hands. With the one, Dismas seized hold of, and clung on to Christ, his Savior; with the other, he strove to take hold of his fellow sufferer for the sake of bringing him to God, so that, after having shared his crimes and punishment, he might also share the never‑ending happiness he so con­fidently hoped for, for himself. Fear is the beginning of wisdom — Dismas therefore turned all his efforts towards awakening fear in the heart of his companion. “Neither dost thou fear God?” he asked him reproachfully. Thou art about to die­ — yet fearest thou not Him Who is about to judge thee? Surely we were guilty enough already, thou needst not add to thy past sins this new guilt; thou needst not insult and blaspheme the Just. Then, as a skilful preacher, the Good Thief addresses himself even to the weakness of his compeer; he touches his self‑love. Wherefore, he says, dost thou insult Him? Dost thou not see that every word thou sayest against Him falls back with tenfold force upon thyself; seeing thou art under the same condemna­tion? But we indeed justly; for we receive the due reward of our deeds. Moreover, if our companion were guilty, as indeed He is innocent, it would be mean and cowardly to insult Him, now that He is in the midst of torments. Unhappily, we know that the words of the Good Thief fell upon the hard rock — that they failed altogether to effect the conversion of his companion. But his charity was all the more meritorious, in that it received no reward in this world. He risked much, and, apparently, gained nothing; for in rebuking and exhorting his fellow sufferer, Dismas took upon him to defend our Lord, and thus drew down upon himself the wrath and hatred of the Jews, who were not slow to wreak their vengeance upon him. For this reason it was that, as tradition tells us, Dismas was the first of the thieves to have his legs broken. In this way his enemies were able at once to punish and to silence him. With Venerable Bede, I ask once again: “Who can help admiring the heroic charity of this thief?”8 I say more; let us not be content with barren admira­tion, let us strive — each one in our own sphere and measure — to reproduce in ourselves what we admire in him. We have already seen in what high degree the Good Thief was possessed of the three theological virtues: Faith, Hope, and Charity. We will now endeavor to show that the cardinal virtues were not behind in hand in the work of his sanctification; but that, on the contrary, his prudence, justice, fortitude, and temperance were in no wise less perfect than his faith, and hope, and love. The prince of theologians, St. Thomas Aquinas, defines prudence as a good counselor, to be consulted in all things pertaining to the life of man, and to the great End of that life.”1 We must, however, distinguish between the virtue of prudence and its counterfeit, worldly craftiness, which has improperly usurped the same name. Such false prudence is either earthly and animal, or it is devilish. It may help a man to enrich and advance himself; it may enable him to realize his ambition; but in so doing it destroys his best happiness, for, in the search after the goods of this world, he loses sight of those of the world to come. All his life long, Dismas had been under the influence of this false pru­dence. He had been a successful robber, and had often escaped human justice. But at last he had been overreached, and he was now paying the penalty — a few moments more, and he would have passed from the agonies of the cross to the everlasting torments of hell. But suddenly, he was converted, and true prudence entered his soul, together with that glorious company of virtues we have already described. At once it showed itself in the examination he made of his past life, in the consequent confession of his guilt, and in the prayer which he addressed to our Lord. Dismas no longer deceived himself. He began to understand what it is to die. He saw that there remained to him but a few seconds of what is commonly called life, but which is, in reality, nothing better than a living death. Without hesitation, he turned his thoughts towards that life which is alone worthy of the name — the life which begins on the other side of the grave, and which is to everlasting. By the light of the divine virtue of prudence, Dismas saw at once the means he must make use of to obtain eternal life. He was enabled to discern the Son of God in the Man who was dying by his side; enabled also to understand the motive of His death. Seeing that He was dying to save mankind, Dismas was only helping Him to realize His object, when he asked of Him salvation. The thought of his crimes humbled him, indeed, and moved him to sorrow, but it could not hold him back; for, however great his sins, he knew that the mercy of his Savior was infinitely greater. He had heard Him pray for those who were putting Him to death, and reviling and blaspheming Him. How much more would He be likely to show mercy to His fellow sufferer, if he asked it of Him. Prudence did not only suggest to Dismas to ask pardon, but it showed him also how to deserve it. It made him understand that it is necessary to confess the sins we would have forgiven; and so, briefly, he acknowledged that his death was but the just punish­ment of his crimes. This one word was enough to set forth their heinousness. In his mode of asking, we see fresh evidence of the divine virtue of prudence. He earnestly desired eter­nal life, but how dared he ask for it? True, that with exceeding great humility, he had made confession of his sins. True, again, that he, and he alone, had taken upon himself to vindicate the innocence of our Lord. Yet would he say to himself: How is it possible that, after such a life as mine, Heaven should be given me at the very first sign of repentance? Does God make so little account of His Kingdom as to be willing to bestow it on one so unworthy, for the mere asking? Some such thoughts as these must surely have passed through the mind of the Good Thief. But in the midst of his perplexity, prudence came to his aid. Ask little, it said to him, and thou wilt obtain much. God does not stoop to measure His gifts, nor to proportion them to our merits, or even to our prayers. He gives freely, without stint. He loves to give what man had not even thought of asking. For God is good, and He is generous. He is almighty, and His mercy knows no bounds. We come, now, to the second of the cardinal virtues. Justice is usually defined as an upright intention of rendering to all, that which is due: to God, everything that we have, since He is Lord of all; and to our neighbor, much, for we are bound to love him as ourselves. Or, as St. Thomas words it: “Justice is that upright­ness of mind by which a man does, in every matter, the thing which is right.”5 The whole duty of man consists in love — love of God, and love of his neighbor. Now, justice gives us the measure, in which to fulfill this duty. Now, from what we have already said of Dismas, it would seem unnecessary, to show categorically the per­fect manner in which he complied with each one of these obligations. Still the love we bear this great Saint, unhappily too little known, obliges us to say a few words on each point of his perfection — even though at the risk of repetition. We will here content ourselves with briefly pointing out that the Good Thief rendered to God all these kinds of homage, by adoring the divinity of Christ as soon as it was made known to him on the cross; by proclaiming, praising, and defending Him from calumny and reproach; by freely confessing his own sins, and acknowledging that he had justly incurred death as their punishment; and by suffering patiently its worst agonies, as an expiation of his guilt. Moreover, by the prayer he addressed to our Lord, Dismas further proclaimed Him as the author of all good, and so fully paid the debt of justice owing to God. Now, secondly, as regards justice towards his neighbor. This debt, also, he paid to the last farthing. Before all, he repaired the scandal of his evil life by avowing the justice of his chastisement. To all, whether Jews or Romans, Pharisees or publicans, priests or people, he proclaimed the innocence of the Lamb of God; and, by His innocence, His Divinity also — for had He not been the Son of God, He would have been indeed, as they falsely said, an impostor and a seducer. Dismas feared not to speak the truth, at what­ever cost. He owed it to God, and he owed it to his neighbor. He did all that in him lay to enlighten and convert those around him — more especially to save that other thief who had been his companion in wickedness, and whom he now longed to gain as his companion in repentance, and everlasting happiness. His was not the fault, if his efforts proved vain. Nor did their ap­parent failure in any wise diminish his merit or his consequent glory. When we consider all the circumstances of time and place, we cannot help repeating that the justice of the Good Thief, as well as all his other virtues, seems to us to have reached a perfection so great as to be unsurpassed, if not unrivalled, by that of any other Saint. None other, we may safely say, showed more heroic zeal for the glory of God, and the conversion of souls: more humility, more faith, more trust, more perfect love, at any given moment of his life, than did Dismas in the midst of the agonies of death. The good thief Dismas is the first human being Christ canonized as a saint of the Church he founded upon earth, sealing it by taking him to Paradise the day they both died. This is a singular event in the history of Christ’s ministry on earth, a singular event in human history, and a singular event in the conversion of criminals, for there is no more powerful intercessionary saint than Saint Dismas. 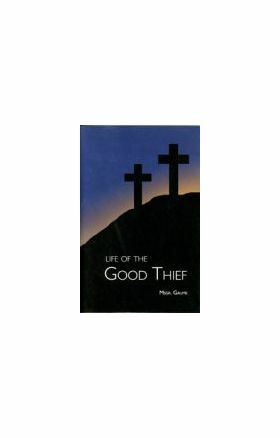 His story should play a major role in prison ministry and the source book for his story is Life of The Good Thief by Monsignor Gaume. It takes a reformed criminal to reform criminals.